Pope Benedict’s recent visit to Israel has made a lot of people there really, really angry. Why? Because he walked into a Palestinian refugee camp and openly called for a Palestinian state. 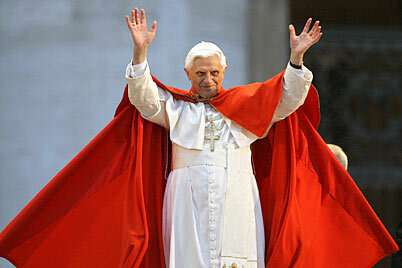 I guess there is no guessing where Pope Benedict stands on this issue. Does anyone still not understand why many Jews are furious? Of course the Pope is not nearly the only major political leader who is pushing for a Palestinian state. U.S. President Barack Obama has also been very open regarding his goal to see an independent Palestinian state created. In fact, there were reports that Barack Obama held a secret meeting with Palestinian leadership last summer even before he became president during which he expressed his desire to divide up the land of Israel and the city of Jerusalem. According to WorldNetDaily, Barack Obama told the Palestinian leadership during a trip to that region in July that he supports a Palestinian state and a Palestinian capital in east Jerusalem, but he asked them to keep his remarks secret, according to a Lebanese newspaper. So Barack Obama wants to divide up the land of Israel and give the Palestinians a capital in east Jerusalem? As if the U.S. didn’t have enough problems…..
Don’t all of these politicians realize what they are doing? God does not bless those who try to divide the land of Israel. In fact, world leaders continue to operate under the delusion that they can find a solution to all of this conflict by dividing up the land of Israel. Hours later, tornadoes returned and Oklahoma City again became the target for deadly twisters, reducing many businesses and homes to splinters and bricks. The tornadoesof May devastated the Midwest with the third worst property damage in American history. Do you still think that all of these things are just coincidences? The truth is that you DO NOT mess with the land of Israel. God has really big plans for that land in these last days. Popes and politicians will continue to do their best to divide the land and negotiate it away, but God’s purposes will ultimately be fulfilled. There will be ups and downs, wars and conflicts, treaties and agreements, but no matter what happens, we know that there is no stopping the Word of God. God’s purposes for Israel will stand.